Moraine Estate Winery is a family owned winery and vineyard overlooking Okanagan Lake, located just minutes from the City of Penticton. From its shelf-like location above striking clay bluffs, Moraine peers over the landscape and water. These iconic glaciated white clay cliffs comprise the breathtaking Naramata Bench and inspire the winery’s land-formed name. The winery owners are the husband-wife team of Oleg and Svetlana Aristarkhov, who, at a time when they were ready to make a life change, were enchanted by Moraine’s setting. The couple believes that wine offers one of life’s most simple, enjoyable, and accessible pleasures; and this philosophy spurred their leap into the wine industry. 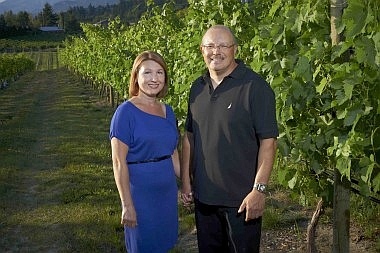 They relocated from Alberta, where they had lived for 15 years, to make premium Okanagan wines. The winery looks out to the lake over the seven-acre Anastasia estate vineyard, which is planted with Merlot, Pinot Gris, Viognier, Malbec, Cabernet Franc, Shiraz and Riesling. The smaller, 3.5 acre Sophia Vineyard, is located closer to Penticton and is planted to Pinot Noir. 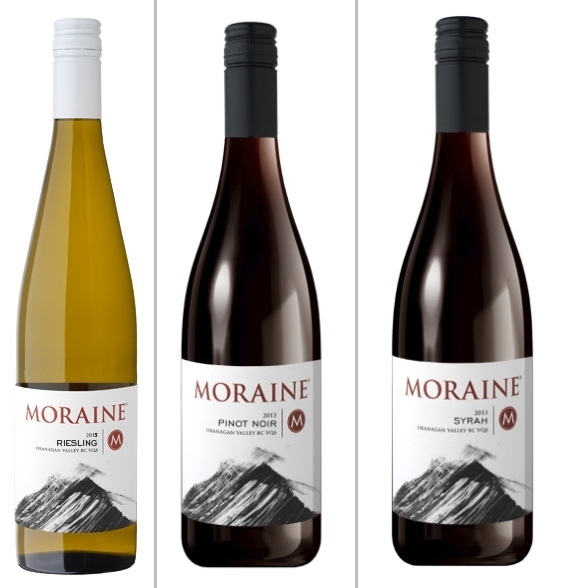 With a goal of using only fruit grown on Naramata Bench, Moraine’s inaugural vintage wines offer a unique, desirable flavour profile. Their Pinot Noir and Riesling year after year are winning many national and international competitions. Recently the Riesling 2015 won Platinum at Great North West competition in Oregon and Pinot Noir 2013 won Double Gold at the International Pinot Noir Challenge, Pinot Noir 2014 won Gold at BC wine awards, and Gewürztraminer 2015 won Double Gold at All Canadian Wine championship. Moraine Pinot Noir 2014 – Our exclusive Pinot Noir was grown at Sophia’s vineyard, carefully fermented is small bins for assuring of developing high fruitiness and lovely aromas of the wine. Pinot Noir was aged for 10 months in the premium French oak. It exhibits aromas of wild thyme, dark chocolate, black cherries, lingonberries and tamarillos. It’s lovely acidity mingles seamlessly with its juicy tannins which will dance on your tongue. Moraine Syrah 2014 – The fruit that made up this wine was handpicked, fermented and bottled on site. The 2014 Syrah was aged in premium French oak barrels for 11 months. Our Syrah presents vibrant aromas of dark chocolate, while pepper and floral aromas are complemented by the juicy inviting tannins. It is best to decanter this wine when drinking young.